ML2Grow always had a intrinsic interest and drive in contributing to the future of growing crops. For example, our team members Stephan Bostoen, a strong believer in vertical farming, and Erik Dielen founded 2Grow in 2017, an ambitious company aiming to reduce the 20% surface area spent on plant production. At the academic level, our team members Joeri Ruyssinck and professor Tom Dhaene have developed machine learning algorithms using the gene expression of plants, among others. This week, ML2Grow as a whole, has followed suit and started increasing its efforts towards accurate machine learning models for yield prediction. 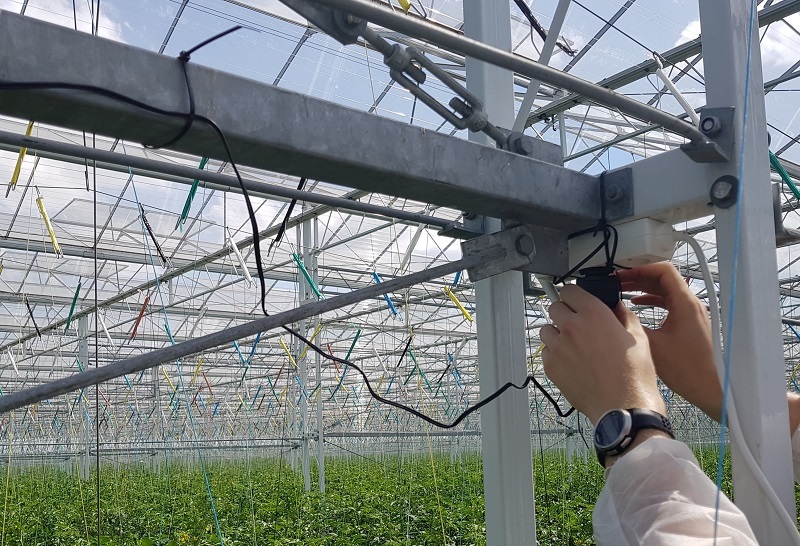 At the facility of Tomato Masters in Deinze, we installed additional sensors with the goal of enhancing our datasets and building more accurate yield models. Tomato Masters shares ML2Grow's passions when it comes to innovation and reducing the human impact on the environment. With this common ground, we have always found in them an open and helpful partner in our endeavors. Despite the increasing temperatures and burning sun, the sensors were quickly installed with a nod of approval of our CTO, Joachim van der Herten who preferred the shade on the ground level. Accurate prediction of the yield of crops offers numerous benefits for the both the producer, retailer and the consumer. Knowing the amount of ready crops upfront allows for a more efficient harvesting effort, reducing the labor cost and the amount of overripe fruits which are wasted. In addition, the retailer can set-up targeted promotions to cope with high yields, increasing profits while offering the consumer the fruits or vegetables at a reduced cost when they are the most tasty. This is a prime example how machine learning techniques can create additional value for all involved stakeholders at a low cost. With the data coming in, the real challenge is just starting for ML2Grow.